This has got to be the fangirl trip of my life… so far. I totally bought into the adage that you only live once so on December 1, I found myself dragging my suitcase through Nagoya as I began my big fangirl adventure. For Arashi, it was eight years coming and it was about time. Within the week, I had CNBLUE tickets, and by the end of October, flights and hotel were booked. The only thing left was, ironically, the most important: scoring an Arashi ticket. Every Arashi fan will tell you that getting an Arashi ticket is like hitting the jackpot. Even FC members are not always lucky and becoming an FC member in the first place is never easy. So for two months, I checked the prices at a ticket site every day like others would check the stockmarket. 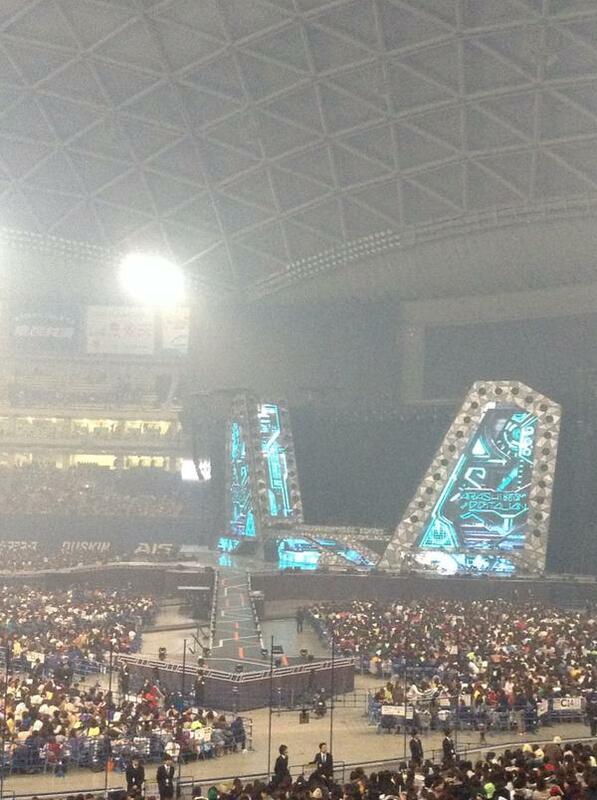 Other fans who have been there, done that, advised to wait until the seats are out. But three weeks into the concert, there was no sign that the prices would go down. In the end, we bought “blind seats” and left it all to fate. Fate (and this blog) also introduced me to my Arashi concert buddy @kyaasarin3. Isn’t it amazing how fangirls often take a leap of faith with people we only know through the Internet? Without her, I might not have been able to get a ticket so I am forever grateful to her and her Japanese friend. I do have Japanese friends, and they are aware of my fangirl life, but I met them through work and they are my senpais so I felt embarrassed asking them to do Arashi things for me. I was only able to breathe properly and focus on planning the trip once the tickets had arrived, a week or so before I was to leave. 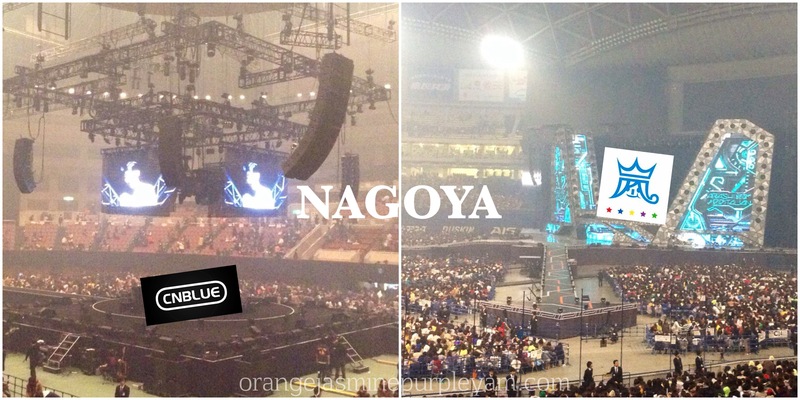 The seats were not bad (at least we were not at the top of Nagoya Dome) but don’t ask me how much we paid for them. It was going to be my first time in Nagoya. I’ve been to Tokyo many times and maybe I wouldn’t have bothered to go to Nagoya, which is not as touristy as say, Osaka or Sapporo, if not for Arashi and CNBLUE. This fangirl adventure started with CNBLUE on December 3 and 4. Nagoya was the last stop in their Wave Tour and I was looking forward to experiencing them perform in Japan, having heard that their Japan concerts are the best. I have watched them in Bangkok, Busan and Manila and the only one I truly enjoyed was Busan where Yonghwa celebrated his birthday and the band did a double encore with You’ve Fallen For Me. 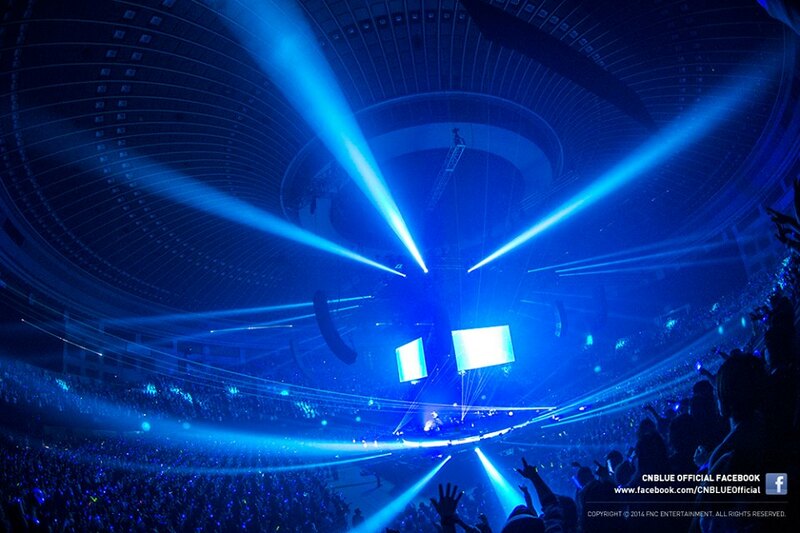 CNBLUE performed at the 10,000-capacity Nippon Gaishi Hall. Both nights, we were in the stands and the seats were not as bad as we expected. In fact, I would appreciate the stands later because it gave me a good view of the stage and the audience. It also gave me a taste of the Japanese audience, who made me appreciate the band’s music even more. It would be wrong to say that Japanese concertgoers are “disciplined” because that conjures images of being stiff and governed by rules that they forget to have fun. Of course, there were staff walking around carrying placards asking people to switch off phones and not take photographs. But for me, that’s just SOP, isn’t it? While this is not a classical concert where you can’t clap all the time, there are also GMRC for rock and pop concerts so that everyone can enjoy the show and not just hear ear-piercing screams overpowering Yonghwa’s voice, or can’t see the boys because your view is blocked by banners and people pointing their phones at the stage. Not that there were no “misplaced” screams. On the final night, there was a fanboy a few rows down from us who kept calling Yonghwa. It was amusing at first, especially considering he was a dude, but it became quite a distraction later especially when the band was speaking. Of course we can’t stop people from doing what they want, we all have different ways to enjoy the concert. But I guess the Japanese temperament suits me more that I cannot imagine watching CNBLUE now in other venues (and I hope the Japanese atmosphere won’t be ruined in the future). Like I mentioned on Twitter, this makes me wonder though how the band feels about the Japanese audience. Yonghwa did say in a previous interview that they are inspired to come up with more improvisations if the crowd is loud and responsive. Not that the Japanese crowd weren’t because they were. I’m sure the band knows the Japan crowd and they seemed to enjoy themselves especially on December 3 when Yonghwa practically took over the “wake up” segment from Jungshin and picked particular members of the audience to shout it (mostly fanboys). His parents and brother were also present with okasan standing by the control booth holding a lightstick and waving it to the music (my Japanese seatmate nicely lent me her binoculars as I forgot to bring mine that day),. They also did several rounds of the wave. But of course, the final night was even more special because of the double encore. I feel lucky to have experienced double encore twice already, the first in Busan and now, in Nagoya. I would have wished for the band to sing other Wave songs like Still or Truth, or Paradise or How Awesome, instead of Radio, but it’s just a small quibble. I spent a lot of time just appreciating the audience view from the stands especially when the lights were off (like the photo below) because it showed perfect synchronization between CNBLUE and the audience. The revolving stage was also perfect as it gave everyone a 360-degree viewing experience. While we take home individual memories from concerts, it’s a collective experience. To me, a concert is a marriage between the performers and the audience and in Nagoya, I witnessed such a harmonious marriage. So if a CNBLUE fan wants to enjoy the band’s music, watching them in Japan is a must. It’s really #justmusic. When December 5 finally came, it felt surreal. The one thing I have been waiting for in my nine years as an Arashi fangirl has finally come: watching them perform live. I have watched them at the Asia Song Festival in Gwangju, South Korea, in 2006, but this is the first time I will be watching them in a full concert live. Watching their concert DVDs did not prepare me for what I saw live. With each and every concert, Arashi always top themselves. They always introduce something new so that it will be a fresh experience for those who have watched them previously. We always have the moving stage and the hanabi, then there were the waterfalls, water screen, augmented reality and the revolving stage in previous concerts. This year, we have the fanlight. Going to an Arashi concert is like attending a matsuri. From the atmosphere in the city (Nagoya Station’s omiyage shop had “Welcome to Nagoya Arashi” signs, obviously to entice fans to contribute to local economy) to the dome. Well, an Arashi concert in itself is a festival. Fans dress up and in Nagoya, I saw Santas, ballerinas, even Debikuro-kun. Some came in matching or coordinated outfits like the twins I sat next to who were obviously fans of Sho and Jun with how they came dressed in red and purple from their sunglasses down to their smartphones. Some fangirls came with their families. Just behind me was a little girl who came with her okasan and obasan. A few rows up were teenage girls who came with their okasan and otosan, who looked like he just came from work, still in his suit and toting a leather bag. In fact, I had my own otosan count for our area alone and counted six. A friend sat next to an ojisan who was holding a fanlight. On the arena level, they gave an area for people with disabilities though I still saw a few come up to the stands in their canes. If that doesn’t tell you the general appeal of Arashi, then I don’t know what will. I suppose it is a Japanese thing, how they manage the crowd in an orderly manner. Nagoya Dome’s regular capacity is 40,500 (for baseball games) but with arena seats added, it could have been a crowd of 45,000 or more flocking to the place but never did I once feel stressed or pressed. First order of course was to have the fanlight programmed. We just followed the crowd and it was then we figured out that the color of the Arashi logo on the ticket actually indicates which counter you should go to. Ours was yellow (Nino). Then it was time to get into the dome. Even when we were in our seats already, it still felt surreal that any time, we expected someone to come along and claim the seats as theirs. We were on the second level but I wasn’t complaining. Just getting into an Arashi concert was a miracle in itself. Whoever thought of the fanlight (which is a modified/Arashified version of the controlled LED lights that other Japanese artists are already using) is a genius. Production banchou Jun, was it you? I don’t buy uchiwa (fan) nor lightsticks but Arashi didn’t leave me with any choice because those who have been to the earlier Digitalian concerts said it’s a must. And it was; it made the experience memorable and the view breathtaking whenever the colors change or switch between sections. No wonder Matsumoto sensei kind of fumed in Osaka when he reminded everyone to have their fanlights programmed before going into the dome no matter how late they are already. And it must have really saved the production a lot of costs with the laser lights that I wonder if they are going to make this a fixture. Like I said, a concert is a collective experience and I never felt it as strongly as on that Friday night. Good thing we were seated next to the twins because they had their choreography down pat so I just followed them and I almost drove myself hoarse singing along to almost every song. And I have never waved as hard as every time they pass on the carts or in the balloons (lucky those who were on the third level, they were almost face-to-face with the bakas). We got a lot of Riida and Aiba, and some Jun, Sho and Nino. I couldn’t help marveling at their energy, going from one end of the stage to the other just to connect to the fans. It is hard work especially for a huge venue but they made it look easy. Yet, Sho’s heartbeat was still the lowest among the five of them, even lower than laidback Riida (they had devices attached to them so their heart rates would be shown occasionally on the giant screens in real time). Jun’s was of course highest at all times; I guess a combination of excitement and stress as production boss. I don’t really remember specific moments (which is a good thing for those who hate spoilers since there are still Sapporo and Tokyo concerts to come) but I do remember laughing so much at Aiba’s solo. I love how Arashi never changed despite their fame and remain the dorks that we all have come to love. I also realized that Arashi may be represented by five guys who are in their 30s already but that there are a lot of people supporting them behind: from the staff who ensure that the fanlights are properly programmed, that you get to your proper seat, to those who manually push the moving stage and the carts and control the balloons, to the dreaded ones who walk around with those placards of reminders, to the lightmen and technical crew, the costume department (I love the white costumes, stylist-san) up to those who manage the crowd’s exit from the dome floor by floor. Just imagine 45,000 people coming out of the dome at the same time, it would be a nightmare. But the crowd control was very civilized. Then of course, Arashi is made up of the sixth member too: the fans. And it couldn’t have been more emphasized than in the final song (the encore was a medley to celebrate their 15th anniversary), Kimi no Yume wa Miteita with photos of fans flashed onscreen. Not sure if those photos were taken during the Nagoya leg or in Fukuoka or Osaka but it was so touching to see the diversity of the fans from children to teens to families. It’s really hard to describe the appeal of Arashi. Live, they are larger than life but still are like regular guys who are easy to relate to. And more important, I saw how they flow as a team. I now understand when they say that they’re glad it’s the five of them. One less or one more won’t be Arashi. And it takes watching them live to really be confronted with that reality because how they flow as a group is just magic. Until now, it still feels surreal that I watched them. Maybe I should watch again in their next tour just to convince myself that it really happened. At least the next time I go for it, I would have learned a thing or two about tickets. While CNBLUE and Arashi are different as night and day–one is a rock band, the other a pop group–they provide my fangirling life a perfect balance. With CNBLUE, I am able to witness a different kind of fan culture that gives a lot of access to them. Arashi teaches me boundaries. And I don’t think I would have had the will to go through the rigors of watching an Arashi concert if not for CNBLUE. I don’t know if I’d get lucky again for their tours to be on the same week in the same city (that depends on Uncle Johnny and FNC). And it’s true, life is too short to wait forever. And only you can make your dreams come true. With the help of luck, kismet and friends of course. Thank you Nagoya for an awesome time! And thank you to my concert buddies @slow88, @kyaasarin3, @azoruix and @dvampyrelestat. yes, the Japanese audience are sugoi with their rhythm! they really have it down pat. I guess CNBLUE had to come to my life to remind me how I can be a fan and not just wait for Arashi to come to me because that will take forever LOL. Thank you for sharing your experience! It’s cool how you consolidate your love of both groups. It’s impossible for me since I’m so one-track-minded. Arashi’s Digitalian concert seems amazing. Seeing them live again after 8 years, do you think anything changed about them? I’m certain there are lots and at the same time very little too. hmm I don’t think it’s a fair comparison because when I watched them in 2006, it was not their full concert, they just did three numbers. but obviously, over the years they have become seasoned performers. while they are still crowd-pleasers, they are more laidback now I bet they can even do the concert with their eyes closed (and might result with Nino stepping on Jun’s shoes all the time as what happened during Nagoya D1 LOL). they’re older too and no longer as nubile as when they were were teens (just ask Sho hahaha) but it doesn’t mean that their performance is much less. I guess they are learning to adapt their dance steps, for example, to their age. but the Arashi that we know remain the same. they’re still dorks and seeing them live, I saw how their teamwork is like. they’re really a cohesive unit. Wow, so glad to know you made it! Thank you so much for sharing your experience. Reading experiences of Arashi fans who made their dream of watching the guys live fuels the desire in me more to pursue the great Arashi dream, too! I watch their recent concerts on the small screen (and now it’s almost every day even at work), and I can really say that watching the concerts on the screen do not really do justice to the epicness of their live performances. And it’s double the ecstasy for you since you were also ! Though I’m not the one who attend the con., but reading someone’s dream come true, esp. when it’s about succesfully watch Arashi’s con. for the first time, it’s my happiness too, and encourage me to have next step in my choices, and for my Arashi’s con. goal, so thanks for this boost! I’m not a fan of CN Blue, but it seems fun to watch their con., and I’m enjoy reading yours. wow you’re one lucky fangirl..I’m super jealous. I want to experience an Arashi Concert in this lifetime, but yeah to be able to do that ,I should’ve started saving money ten years ago. On the CNBLUE concert I attended, Minhyukie also got the loudest screams. He deserved it, drummers have the most exhausting jobs ever. I developed a lot of respect for drummer after seeing Minhyuk playing the drums nonstop for more than 2 hours. Japan is also strict with photos and videos during concerts and will throw you out of the venue if caught but ofc there will always be hardheaded ones who try to get away with it. I didn’t notice if they lipsynched but I read for some numbers they do, especially when it’s fast one. what I noticed though, I don’t remember the song, was when I suddenly noticed Nino’s voice coming on in the middle of a line. so that means that they do sing live. Based on your pic I think your seats for the Arashi con were good/not that far compared to other fans’, were you able to see their faces quite clearly on stage? How do they look like in person? haha. And yes, all the stress pre-concert was worth it! wow, I want to experience that confusion too, not knowing where to look because they’re all over the dome.. the DVD can only give you one scene at a time, hehe. As expected of Aiba, I really think he’s very ikemen. Haha, so Sho looks just like how he looks on TV? Wow, you had pretty decent seats from what I can see in the pictures! I really enjoyed reading about the concert; I went to the Osaka con, but didn’t hear about fans not programming their fanlights beforehand? I guess it must be on the later dates. ah you were in Osaka! I read it from tweets, it was in Jun’s closing speech when he talked about “unity” but I forget which date it was. if that isn’t kismet, then I don’t know what that is! I think based on row, you can check which level it is. hmm I don’t remember how long it took us to get out of the dome and to the trains. we were not exactly rushing…but they have very efficient crowd control. third level gets to leave the dome first if I remember correctly.